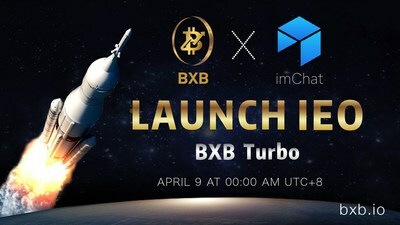 TALLINN, Estonia, April 5, 2019 /PRNewswire/ -- BXB announced that IMChat will be launched on BXB Turbo as the platform's first IEO project on April 9, 2019 UTC+8. Kwun, CEO of BXB Exchange commented, "IMchat is a very solid and mature project. They have market-proven products and a significant user base which gives them a large development space in the IM industry. Among the many projects that we have reviewed, we are very excited about IMchat in particular. We are very happy to have them as our first project to be launching on BXB Turbo. We are looking forward to seeing the success of IMchat." Please visit BXB Turbo Launch for detailed information. BXB is an Estonia-based financial and blockchain technology company. BXB's vision is to enable all small and micro investors to participate in digital asset transactions and make the experience more fair and convenient. BXB differs from others exchanges in that it provides coin-to-coin trading, options and futures trading, all in one platform.